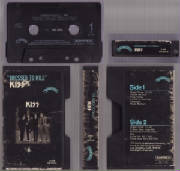 The black cassette tape is enclosed in a black hardshell slipcase. 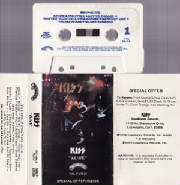 The 1st issue (Feb. 1974) does not include the song "Kissin' Time". 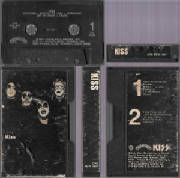 A cassette version may (or may not) exist with the song "Kissin' Time" (July 1974). 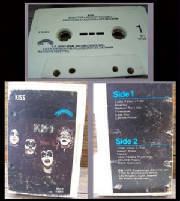 The vinyl and 8-track formats distributed by Warner Bros., do have versions with the song included. 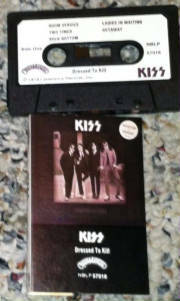 If a cassette version does exist, I have never seen one. 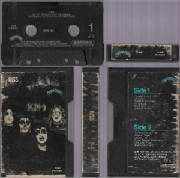 The black cassette tape is enclosed in a black hardshell slipcase. 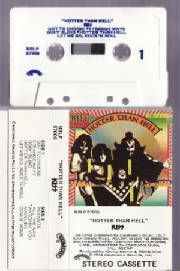 In 1974 and 1975, the self titled (debut) album was reissued (Sept. 1974) and the 1st issues of Hotter Than Hell (Oct. 1974) and Dressed to Kill (Mar. 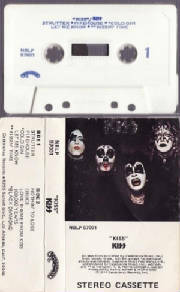 1975) were released on Ampex tapes. 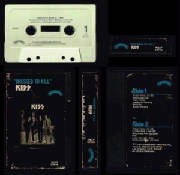 The self titled (debut) album includes the song "Kissin' Time" as does all reissues going forward. 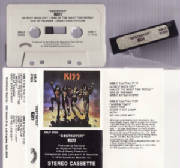 The cassette tape is enclosed in a hardshell slipcase (both a black and a white version exist). 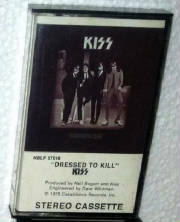 This reissue series was released sometime in mid-1975 (April - August) Sometime after the 1st issue of Dressed to Kill, but before the 1st issue of Alive!. Very similar in appearance to the earlier Ampex releases, but with different stock numbers, and no mention of Ampex on the case or tape. However, some versions exist with a Columbia House Record club sticker attached to the case that reads "Manufactured by Ampex Music Division for Columbia House" So it appears these are also Ampex tapes. For photos of the Columbia House sticker version please see the CRC section. With the release of Alive! 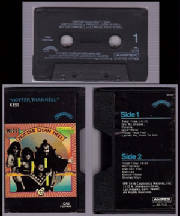 (Sept. 1975) the style of cassette cases changed to the "lift open style" that is most commonly known (instead of the hardshell slipcase from the earlier years). This style of case opened up like a book and the hinged part of the case was clear so you can see the paper cover ("J-Card") underneath. The 1st issue of Alive! 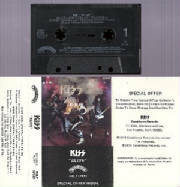 has a black cassette tape and the "J-Card" has the 50¢ booklet offer on the foldout cover. This is a strange series. All cassettes are black with paper labels. This might have been a limited series in connection with the release of Alive! in 1975. However, this might also be a counterfeit series. Here is my concerns with this series. 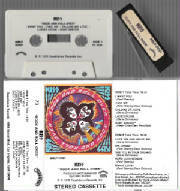 1) The self titled debut has the date 1973 printed on the label. 2) Hotter than Hell has no album title on the spine and the cover art is pinkish/purple in color. 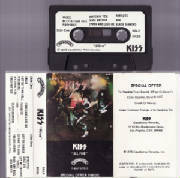 3) Dressed to Kill has the vinyl hype sticker printed on the cover. 4) All four cassettes have the "Casablanca" logo printed on the paper label, but all of the logos are missing the registered trademark symbol ® . 5) Only Alive! has an address on the cover along with the $1.00 booklet offer. Some might think all the errors were due to it being a transitional era tape. 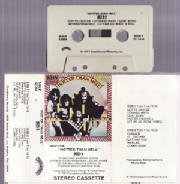 But, as the Alive tape posted above with the 50¢ booklet offer plainly shows, they had already transitioned just fine. It could simply come down to these being manufactured at a different plant. Counterfeit or official, either way this series is too cool to ignore. 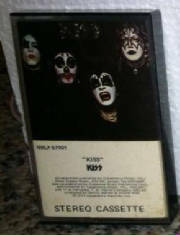 There are also 8-track versions that corresponds with this series. This series was released sometime after the 1st issue of Alive! (Sept. 1975) but before the 1st issue of Destroyer (March 1976) The Sherbourn Drive address is still in use. 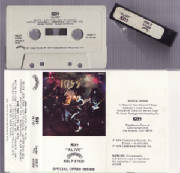 Cassettes in this series are commonly white with blue text. 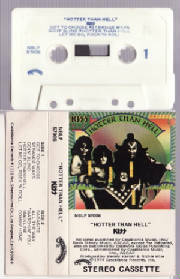 The Hotter Than Hell album in this series can be found with a printing error cover that is green in color. Other than myself, I know of at least 3 others that have the error cover. 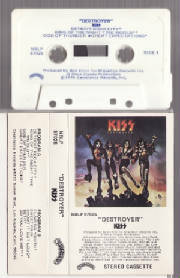 This series was released around the time of the 1st issue of Destroyer (March 1976) The Sherbourn Drive address is no longer in use, being replaced with the Sunset Blvd. address. 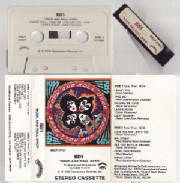 Cassettes in this series are commonly white with blue text. This is yet another strange series, the series appears to have been released sometime after 1976 (Sunset Blvd. address) but before 1977 (no filmworks logo). There are some strange characteristics in this series, that differs greatly from previous and future series. The cover layout is very different, for instance all in this series have a foldout type cover (with the exception of Alive!, the series before and after this do not). The cassettes in this series are also very different in style, grey with black text and extra text not included on previous or later series. 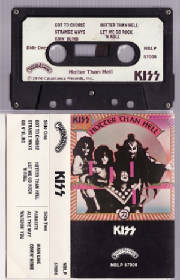 Also printed on the cassettes in this series is the letters "TT" (total time) with playing time added to each side. There also are variants in this series. 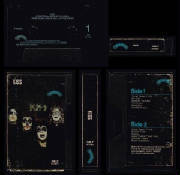 Some have the number "73" printed on the spine and the cassettes with those covers have a black dot printed in the upper right corner of side 1. The number "73" is a plant number for Columbia Record Productions in Terre Haute, IN, also known as "Columbia House Record Club (CRC). It is my believe that this series, at least the ones with the "73", if not both versions are actually very early Columbia House Record Club editions. Most in this series seem to have a title strip sticker on the top edge of the case (If you are lucky enough to find one in its original case). This series also shares characteristics with the NBL series (1977-78) that will be discussed later. This series was released around the time of the 1st issue of Rock and Roll Over (Nov. 1976). ????? ?